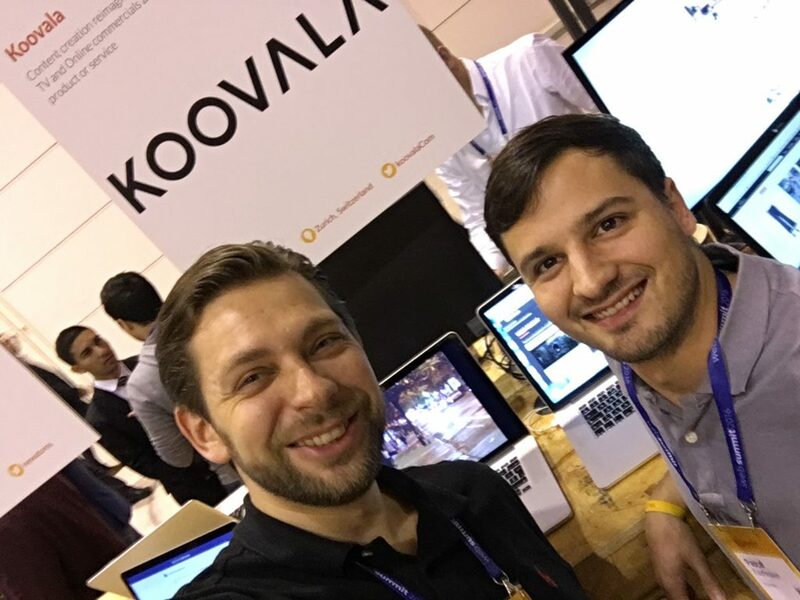 In the beginning of November, I was at the WebSummit in Lisbon as an Alpha-Startup with my company Koovala. What we experienced exceeded all our expectations. Admittedly, that was easy since we went there rather unprepared and without many expectations whatsoever. But still, the experience was amazing and we can recommend participating without reservations. I’ll give you 5 reasons why in a minute, but let me give you some background information first. Companies face a new reality: Video Content is more relevant than ever. By 2019, 80% of all internet traffic will be generated with video, habits for content-consumption have changed. For marketers, that means that they need to have a constant supply original, compelling content to distribute. The thing is – content creation is very time-consuming and expensive, especially in the field of Branded Content and Ad-Creation. Koovala is your fastest way to exclusive, original TV-ad content. Buy ready-made, fully produced TV- and Online-Commercials Online, individualize them to your specific brand, product or service and be running your campaign in no time. Tapping into an international network of professionals, Filmmakers and Creatives create video advertising that companies then can browse by industry, product, mood and many more. When they find an ad they like, they can customize that ad in various ways: add their logo and claim of course, different music, text and voice over, color-grading, editing and so on. They can even request a reshoot if they, for example, need to have their product in the video. Computer Generated Imaging offers yet another wide range of individualization options. For clients, this means a fast way to get original, high quality content at a very competitive price. I could go on and on about all the advantages for all parties involved, but I’ll stop here and just say that we think we are building a new future of how content can be sourced. 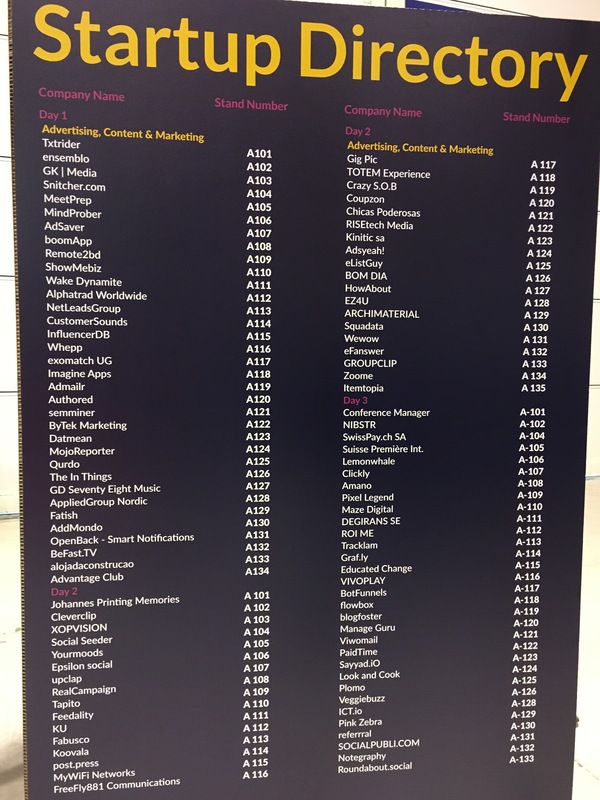 A couple months back, I stumbled across WebSummit for the first time. My guess is that, if you’re working as a Startup, chances are high that the same happened to you – their Marketing is very agressive, but effective. They started out as a very small tech conference a couple years back and have now become one of the (if not the) biggest and important event for entrepreneurs and techies with over 50’000 attendees this year. In fact, they got so big that they had to leave their origins in Dublin partly because of that. Infrastructure could simply not handle this amount of people flooding in from all over the world. Lisbon is amazing. It is such a beautiful city. If you’ve never been to Lisbon, do go there – architecture, food, people, weather, everything is just great. 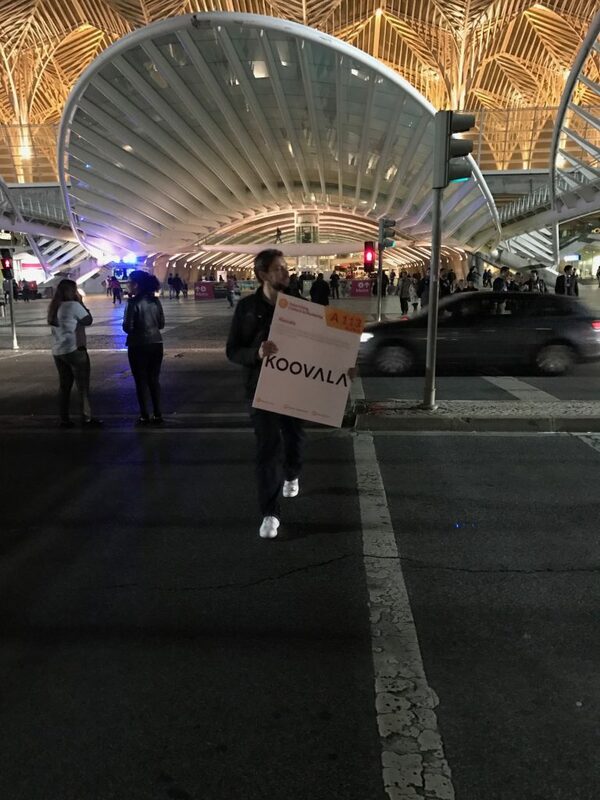 The venue for Websummit was great, too, easily reachable by public transportation (it does get crowded, but what the hell) and big enough to host a great amount of people. The grand opening was a bit tricky – getting 50’000 people into the main arena was simply not possible, so tons of attendees found themselves outside, not really knowing what to do other than watching the event on the big screen in front of the venue or on their mobile phones via Live-Stream. Pascal, my Co-Founder and I, decided to head back to town and have a first look at the nightlife. What also amazed everybody I talked to was that it seemed like all the Locals were talking English, and they enjoyed it. Cab Drivers, Cashiers, People in the Street, everybody was really open, eager to help, proud of their city and always available for a quick chat. You know how in some countries you get the feeling you insult people by not talking their native tongue? Well Lisbon people are different, and it just adds to a great atmosphere for everybody. It is pretty well known that some of the best deals are being made over a beer or two. 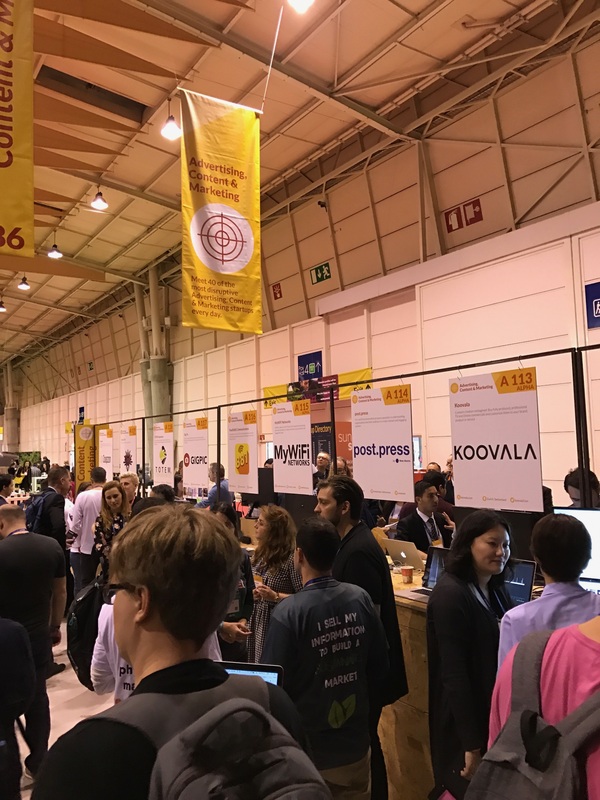 During WebSummit, the attendees basically took over the town, so it was incredibly easy to meet people. In fact, we made connections on the first night that will be of great value for us as a company going forward. 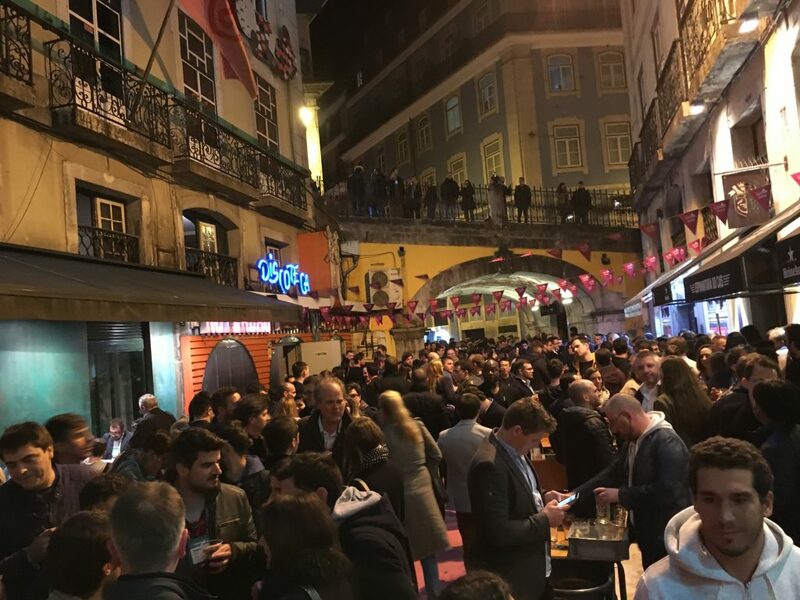 Pink Street was packed, drinks were cheap, music was good, mood was great, and even though the organised Pub-Crawls did not really happen because of the sheer amount of people, it was a great way to get to talk to people from all over the world. There were some great speakers this year, and topics covered ranged from how to prevent Burnouts to Funding and Future Technologies. Lots of great Founders, CEOs, CTOs were present and offering interesting insights. Admittedly, chances are you’ve heard a lot of the discussions before, but it’s nice to actually see and meet people in real life. This probably is the most important one. The sheer amount of opportunities that present themselves by talking to people is mind-boggling. All of a sudden, you have business cards from people that you either always wanted to get in touch with or from people you had never given a thought that can actually add to successfully build or expand your business. Make no mistake though, this was hard work. Pascal and I effectively had no break and were talking for 9 hours straight. And you do have to deliver. If you don’t have to show something that is of interest to people, you will not have the same experience. Our booth-neighbours did not get the same traction, looking at us saying „how do you do that?“. You really need to show off something that is exciting to people, and you have to know how to sell your product; there is so much to see that you have to stand out either with your idea or your presentation.